Remembering gratitude on this Thanksgiving. Last year, I remember going through the effort to create a fabulous Thanksgiving meal. I made all the sides and meticulously selected the dishes for serving them. I prepped dough for pies, made cranberry sauce, and even brined my turkey in preparation. I remember tending to my small flower garden and freshly picking a bouquet for a vase to display on our kitchen table. I remember finding a yellow table linen and some candle sticks, archived in a closet, and pulled them out to add even more of a sense of holiday spirit. I spent the whole week really, just getting ready, and true to food blogger form, I shared much of those moments on social media. But here’s the thing about social media… The communities we make online are never a substitute for the real thing. 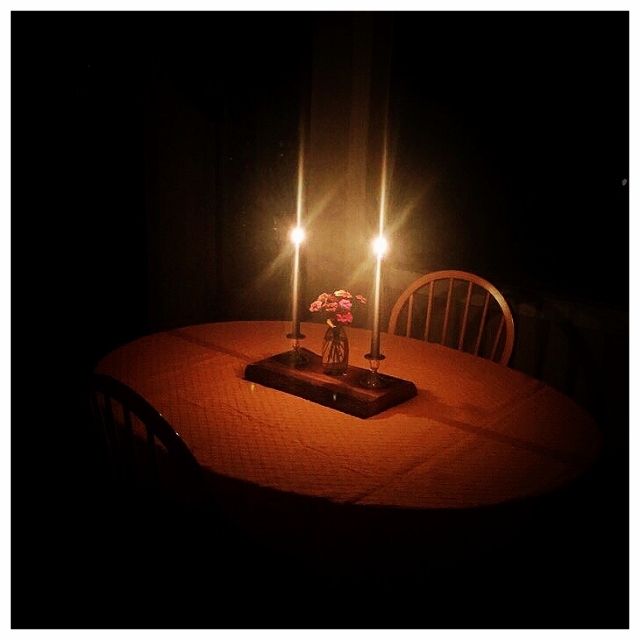 At the end of the day, my Thanksgiving extravaganza, as much as it was “shared,” was a lonesome table for none. A table for one never felt more lonesome because even I was a no-show. Why bother if it’s just for me? My father wasn’t interested in anything more than his usual peanut butter and jelly and I mostly felt defeated in recognizing the reality. I had no one to really share my Thanksgiving meal with and I couldn’t help wondering, what was the point? Fortunately, my childhood best friend Erika, invited my dad and I to her mother’s house. Prior to her phone call, I felt sad for myself. I went to great lengths to create a Thanksgiving feast, so intent for the purpose of sharing but without a single human to enjoy it with. I actually felt pathetic… Showboating for a social media post… It took some effort to convince my dad but we went and so did my side dishes! It was remarkable to witness generations of a single family all in one place, eating and laughing, and even arguing at times but ultimately enjoying each other’s company. Erika saved my day but there are many folks without someone to share in a sense of togetherness. The company we keep helps form our communities and a life without the presence of another is depressing at best. We are increasingly separated by circumstance, be it a natural disaster, political differences, civic duties and your run-of-the-mill, family dynamics. There are endless reasons for why we can’t come together, which makes me think that the effort to unite is time well spent. The holidays give us that reason. They provide great impetus to strive for union even as aspects of life will forever remain obstacles. But defeat is not an option, right? Challenges, no matter how they appear, are opportunities to double down and compound efforts when they matter most. So this year, in recognition of so many that are separated by unfortunate circumstances, I am sharing gratitude and hoping it carries good tidings to someone that feels lost, or helpless, or alone , due to playing the tough hand life’s dealt. You don’t have the right to the cards you believe you should have been dealt. So, in honor of November’s gratitude call, I’m attempting to give back to two organizations. The first is the veteran’s organization, Hope for the Warriors, that has a scholarship program and additional support services specifically for caregivers. As a caregiver to my father, whom is a veteran of the Korean War, supporting Hope for the Warriors is an initiative I can get behind. Additionally, I have formed an unlikely friendship with a man named Richard, a Vietnam War Veteran, whom spent the last five years caring for his wife as she suffered from Alzheimer’s. Richard and I quickly bonded over the stress of the caregiver life. He has helped me some in managing my dad and has also become my mentor of sorts into the world of copper and scrapsmithing. It’s only fitting that our first collaboration serve to benefit those in similar situations. The Copper Cutlery Set is our proudest collaboration thus far and we are happy to dedicate 25% of the proceeds to help fund caregiver initiatives with Hope for the Warriors. The second organization I want to support this month is the International Association of Fire Fighters that have been heroically serving on the front lines of the wildfires raging throughout California. The Torched Oak mixing spoon is for sale with 50% of the proceeds going to IAFF as I can think of nothing more symbolic of life support than a spoon. The handle detail includes torch marks honoring the brave men and women fighting on the front lines to protect individuals and communities from the threat of wildfire. So many have already lost everything but this is a little something I (or rather, we) can give back in support. In the scheme of things, the cash amassed for these two organizations through spoon sales is nominal and it’s easy to fall prey in thinking one’s efforts are not enough. But for the person that feels they have lost everything, the smallest of gestures can feel like the world. We live often disconnected from the impact of meaningful relationship building. I say meaningful in that feelings are exchanged over a shared experience where multiple parties connect through a mutual affection for a moment. Creation of a sense of belonging with intentional gestures to foster a fellowship for care… This is how we cultivate community. Last year, Erika ushered me out of my depression and into her community with a small gesture of kindness. It was just a phone call, but more than that, it was care. And as you gather this Thanksgiving Day, I hope you take a moment to acknowledge that this day is special. Not for the food or the history of how Thanksgiving came to be, but the fact that we just don’t do a good job of creating opportunities to build connections. The holidays in general, for better or for worse, give us reason to be together, so let’s make it count!